On YouTube, the company behind the video clearly stated it was fiction before their account was removed. But on WhatsApp, where the video has been passed on without that clarification, some users were fooled. Opening with a familiar shot of the BBC newsroom, a grim-faced presenter announces a "serious incident between Russia and Nato". "Although the details are uncertain, early reports indicate that a Russian surveillance aircraft was fired upon by naval vessels of Nato forces," the presenter says. As the report progresses, the incident escalates to the point where Russian warships have fired on Nato targets, the Royal Family has been moved, an emergency broadcast advises everyone else to stay at home and thermonuclear war erupts, destroying the German city of Mainz and part of Frankfurt. Again, this is a work of fiction. It is nicely produced, but there are several key giveaways. How can you tell it's not real? Although BBC branding is used in the video, the font, style and layout is very different. If you are sent a video on WhatsApp which appears to be from a major media organisation but you are not sure, search for it on the organisation's website. In this instance, if thermonuclear war was breaking out in much of the world and the BBC had reported on it, it is likely the news would be mentioned on the website and would be corroborated by other news organisations. Who made it and why? The video features actor Mark Ryes and was produced for an Irish company in 2016. Mr Ryes told the BBC: "It was created by a company called Benchmarking Assessment Group as a psychometric test for their clients to see how they'd react in a disaster scenario. "On the original YouTube posting it says very clearly that it's fictional. It doesn't even look like a genuine BBC News report. It was never meant to. "As an actor playing this role, I recorded the video against a green screen. I had no part in the editing or production of the final piece." Mr Ryes sent his recorded material to David Ringwood, Benchmarking Assessment Group's head of assessment services. According to the company website, Benchmarking Assessment Group was "founded in 2006 in Ireland" and works with clients to develop "methodologies in assessment for selection, development and talent management". Mr Ringwood had not responded to requests for comment at the time of writing. What does the BBC say? 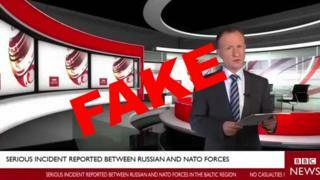 On Thursday morning the BBC press office tweeted it was aware of a video clip "claiming to be a BBC news report about Nato and Russia... circulating widely". "The video appears to have come from YouTube, where there is a disclaimer about it being a fictional dramatisation," a BBC spokesperson wrote. "However, this information isn't being repeated when it's being shared, hence our tweet," it continued.